People who know and love Tartine tend to fall into two categories: people who live nearby, and people who go to BYOB restaurants. 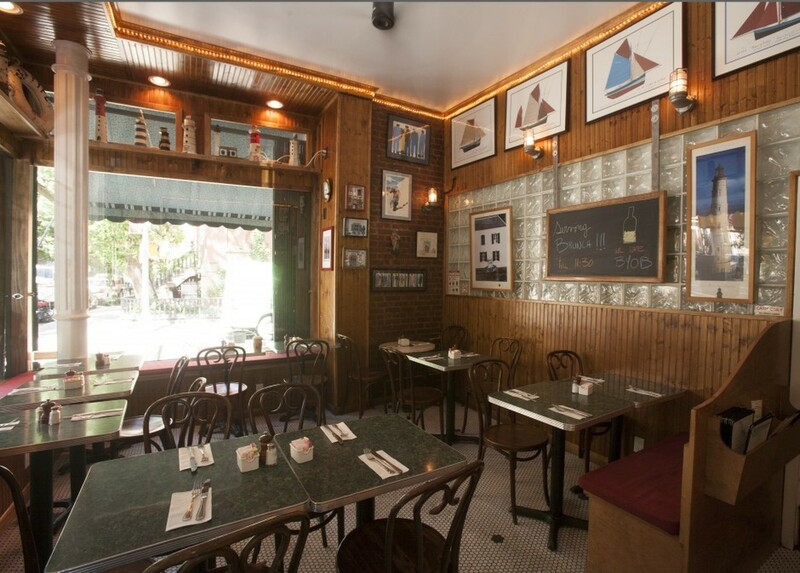 This idyllic spot has all of about 15 seats, and has been sitting quietly on one of the best corners in the West Village for decades. Brunch is their most popular meal - to the point that people line up down the street waiting for a table on most fair-weather weekends - but dinner is perpetually crowded too. We’ve always found the food at Tartine to be consistently solid, and even though it’s never quite awe-inspiring, the aesthetic appeal and the value make this a good place to know if you’re in the neighborhood, or just looking to eat well without mortgaging your future. It’s perfect for anyone who wants to have a nice dinner with their favorite bottle of Pinot from the cellar (the fridge). A staple from the brunch menu that’s basically eggs benedict with gravlax instead of Canadian bacon. It’s tasty. As you would hope, Tartine does a better than respectable omelette, which you can customize with your choice of fixings. This is our order at Tartine for brunch. They use a homemade brioche, and it’s delicious. This huge apple pancake is like a plate-sized donut with powdered sugar and probably lard. Ok probably not lard, but this thing can’t be good for you. One of the best around. We love this, especially when it’s cold out. The mussels at Tartine come two ways, but to order anything but curry mussels is a huge mistake. These guys swim in a broth of curry, coconut milk, garlic, and cilantro. Fries are included, which makes this a must-order. Pretty sure the French didn’t invent guacamole, but this spicy chicken is served with some and it’s really good. Chances are high that you’re gonna see this on the table next to you, which will most likely be exactly two inches away. It’s a fan favorite. This is basically chicken in a puff pastry with some mushrooms and other good stuff. You won’t be bummed about it. On our last visit, we had an excellent skate from the specials menu, served with some root vegetables. We’d order it again.